The journalist Hanna Axelsdotter is passionate about solving women’s issues and she can’t put the case about Nora behind her. The young woman is just about to be released from a long penalty in prison. Hanna remembers Nora's cold and emotionless appearance at the trial that she was doing a report on. The beautiful face without a trace of regret. Hanna decides to interview Nora in prison in an attempt to understand what led to the violent act that put her in there in the first place. In front of the camera Nora tells the story of her and her sister Linn’s childhood. A story about guilt, shame and the balance of power. How can Nora make up for what she did to her sister that led to their separation? 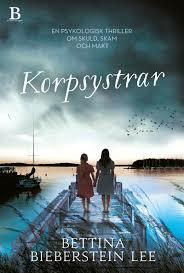 The Raven Sisters is the first book in a series of stand alone novels about the Journalist Hanna Axelsdotter.